The Republicans had yet another stinking debate last night with the five remaining candidates: Donald Trump, Ted Cruz, Marco Rubio, John Kasich, and Ben Carson. It was terrible. They are all terrible. The Washington Post has a complete transcript. My sympathies to whomever had to try to write a transcript of two and a half million hours of five blowhard dipshits just screaming at and over each other. I live-tweeted the debate, and I've compiled those tweets into a Storify. Cruz and Rubio tried to attack Trump at every opportunity, largely a futile effort because Trump has decades of experience being a smug, nasty bully. Whatever they could give him, he could give back double. 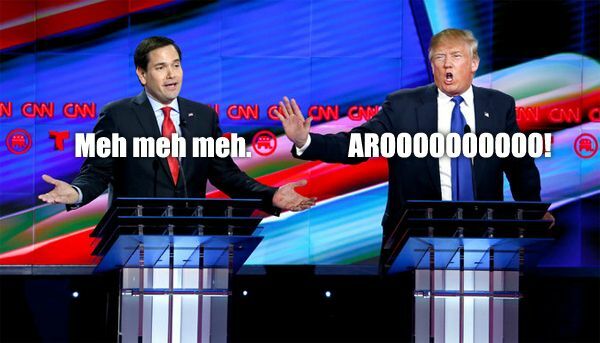 Rubio's smarmy "ha ha can you believe this guy?" approach seemed particularly ineffective to me. He didn't manage to successfully rout Trump, but did make himself look even less like the moderate, mainstream, competent, grown-up candidate he is reported to be. It was also a futile effort because they have no real material with which to work, since the Republican Party has incredibly failed to do oppo research on Trump. (Editor's Note at the end of that piece: A+.) By comparison, "one Democratic opposition research said that they've spent the past eight months compiling material on Trump as he's risen up the ranks. ...That researcher estimated that of all the material they've compiled—court and property records, newspaper clips and videos—approximately 80 percent of it has yet to surface in this election cycle." So, essentially, Trump's Republican opponents aren't well-armed to attack him. And they aren't gaining on him. Super Tuesday is next week, and he's likely to win a majority of the states. The Republicans say they failed utterly to vet Trump because they didn't take him seriously, and they claim that they don't want him as the nominee, but I have my doubts, frankly. He's been extremely successful at articulating the GOP platform—the reason his opponents can't attack him on policy is because they share the same policies—and cultivating enthusiasm among the GOP base. After the debate, Republican National Committee Chair Reince Priebus tweeted: "Tonight we saw another spirited debate between the most diverse & well-qualified group of presidential candidates in history." That doesn't sound like a party who's mad about Donald Trump, his huge lead, and his disgusting campaign. As always, my summation is the same: None of these men should be allowed anywhere near the Oval Office. They are awful and they are dangerous, and any one of their administrations would be ruinous for the country.